It's a hard to imagine a world without public libraries. Franklin, Massachusetts claims to be America's first public library, established in 1790 with a collection gifted to the town by Benjamin Franklin. They asked for a bell but Franklin decided that "sense" was preferable to "sound" and responded with an offer of books instead. It was the start of a very, very good thing. Our Learning With series this week is dedicated to learning a little bit more about the children's section of the library. I hope each of our readers has access to a public library as amazing as I do. In addition to a fantastic selection of children's books, our library plans great events, offers specialized programs, book clubs, prizes and so much more. The managing librarian for children's section at our local library, Lucy Salvado, graciously shared some of her insights with us today. What are 10 of your favorite picture books for children? What is your process for adding to the children’s library collection- do you have specific criteria? How often do you add new books to the library? We have a collection development policy that basically says the library is a forum for information and ideas. It provides book and non-book materials that contribute to the cultural, education, and recreational enrichment of the community The primary goal is to provide the best possible collection. The decision to select an item is based on demand, anticipated need, and the effort to maintain a wide and balanced collection. Staff reads professional reviews and decides if the book would be appropriate for our library. Books are ordered regularly. On average, we add about 300-500 books a month to the children’s collection. That includes everything – board books, picture books, readers, fiction, non-fiction, audio books, playaways, music CDs, e-books, magazines, and paperbacks. How long of a shelf life do library books usually have? How do you decide when the library is done with a book and needs the shelf space for something else? There isn’t a magic number as to how long a book may last in the library. It depends on how popular the book is and the quality of the book. Some books are very popular and can be a part of the library’s collection for many years. Other books are so popular, we need to reorder copies because the books fall apart. Sometimes books aren’t as popular so after about 2 years, we give them to the Friends of the Library. They sell them in their Book Corner, a used book store then the Friends fund children’s events and special programs. The majority of our fiction collection (picture books, readers, and chapter books) have all checked out in last year. Is there a process for parents/patrons to request specific books to be added to the collection? Library patrons may make a request for the purchase of a title. Each requested item will be considered in terms of its value to the collection and the audience for whom it is intended. What are some library resources for children that are underused or that you wish parents were more aware of? Reading is such an essential element of a child’s life and libraries are valuable assets. The Yorba Linda Public Library promotes a love of reading by providing a wealth of good books and the highest quality children’s programs. The library places emphasis on lifelong learning for all ages and specialized programming that encourages reading and the pursuit of knowledge. 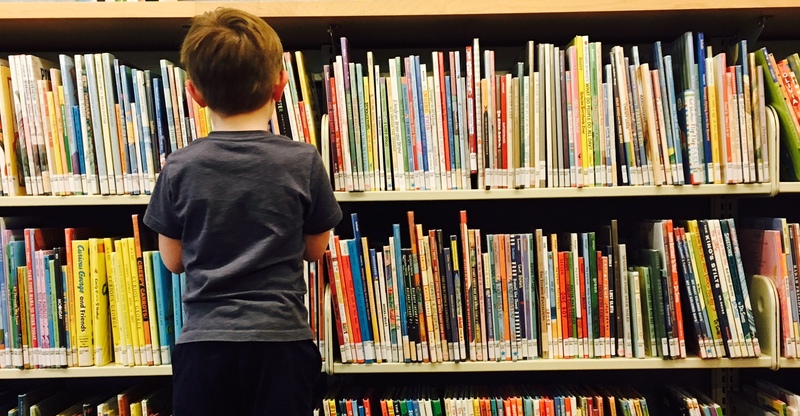 On average, we have over 1,000 people who visit the Yorba Linda Public Library a day so we are definitely not underused but there are so many parents who don’t know all the wonderful things the library has to offer. We have specialized programs for infants through adults. We provide big events including a sleepover at the library for 100 kids and parents. 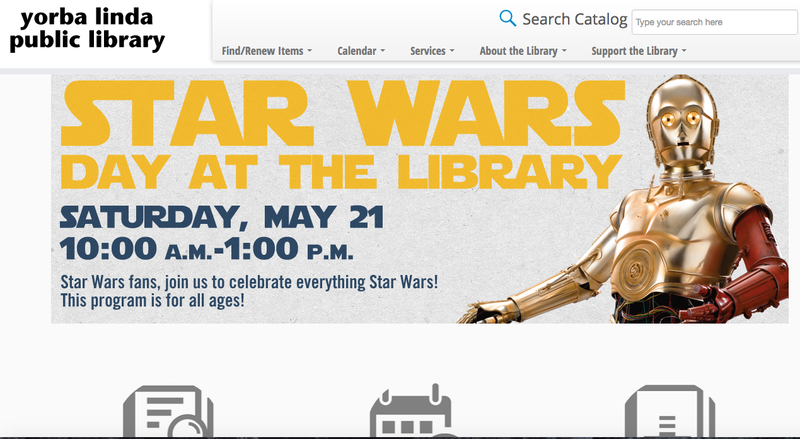 Star Wars characters visit the library every May for our Star Wars event. (This year, Star Wars Event will be on May 21.) We have reading clubs where kids can earn prizes for reading. One of our big raffle prizes is an iPad. We offer e-books and online services including homework help so if a student is stuck doing a math problem that he may not understand, he can connect to an online tutor to get assistance and the best part about it, is that it is free to use. If I had one wish, it would be for every parent and child to visit their library regularly so they could take advantage of the opportunities to bond with one another while sharing stories and activities that stimulate social, emotional and intellectual growth. Is there any specific library etiquette that you wish parents would work a little harder at teaching their children? Libraries are not as quiet as they used to be. There are students reading, doing homework, socializing, using the computers. They are great places to explore and make new friends. I would say, it is important to just be respectful. I hope this inspires everyone to take a moment and explore some of the hidden resources offered at your local library- or maybe just thank a librarian for all the hard work that goes into curating their collection and engaging the community.